When summer comes, you will notice your dog vigorously scratching his/her skin. The catalyst behind this increase in scratching is fleas. The most common to dogs is the dog flea also known as Ctenocephalides canis. If your dog is a victim of flea infestation then you have a pretty good reason to worry as these minute blood sucking parasites can spread Dipylidium caninum also known as the flea tapeworm. This is not all, fleas can cause severe itching leading to extreme discomfort and a variety of skin problems and in some cases severe Anemia. The solution lies in removing the fleas and ensuring prevention of flea infestations. This is where Capguard oral flea treatment medication can work wonders for your dog. Capguard is an oral flea treatment medication for dogs that is being manufactured and promoted by SENTRY, which is a brand name of Perrigo. This is one of the leading global healthcare companies focussing on delivering high quality and affordable healthcare products®. SENTRY offers a variety of products for dogs and cats that are focused on killing fleas, flea larvae, flea eggs, ticks as well as chewing lice. Capguard is one of their most popular all time flea killers! SENTRY Capguard is a flea killer suitable for dogs, puppies, cats and kittens 2 pounds of body weight or greater and 4 weeks of age and older. Safe for use in dogs, puppies, cats and kittens 2 pounds of body weight or greater and 4 weeks of age and older. SENTRY Capguard oral tablet containing Nitenpyram begins working within 30 minutes of consumption by your dog. It is used primarily for killing adult fleas on dogs weighing 25lb or more. Note: It is important to weigh your pet prior to starting Capguard administration as this will enable proper dosage. It is also advised not to administer the same to dogs weighing under 2 pounds. CapGuard has to be administered orally. Place the Capguard tablet or pill directly in your dog’s mouth. Alternatively, you can also hide it in their food and ensure that they swallow the tablet with their food. If you hide it in their food, you need to watch closely to ensure your dog swallows the tablet. If you are not sure whether your dog has swallowed the pill then you can always give a second pill. A single dose of SENTRY Capguard oral flea tablet will be able to kill adult fleas on your dog. If your dog gets re-infested with fleas then it is safe to give another dose the next day or within 2 days. It is recommended to refer to the package insert or a vet for complete dosage information. Each SENTRY Capguard oral tablet contains 57 mg of Nitenpyram. This is what makes the medication an effective flea killer. So what is Nitenpyram? It is a type of insecticide that is most often used in the field of agriculture as well as veterinary medicine. It is used for killing pests and external parasites especially in household pets and cattle. A more medical perspective defines Nitenpyram as a neonicotinoid, which is a type of neurotoxin that can block neural messages in the central nervous system of insects and thus causes rapid death. SENTRY Capguard flea tablets are quite safe for your adult dog although some dogs may show minor side effects. These include lethargy, vomiting, depression, decreased appetite, itching, hyperactivity, diarrhea, trembling, incoordination, panting, nervousness, vocalization, fever, allergic reactions including hives, salivation, and even seizures. An extremely important aspect of flea treatment using Sentry Capguard is that it should never be administered to dogs below 25lbs of weight or less than 8 weeks of age. Research studies have mentioned that when administered to such dogs serious medical symptoms have been noted including neurological symptoms and even death. In cases where it was administered to pregnant mothers weighing less than 25lbs, fetal or neonatal loss as well as birth defects was reported. The Capguard flea medication needs to be stored at controlled room temperature i.e, between 15°C-25°C or 59°F - 77°F. It is not for human use and should be kept out of the reach of children. 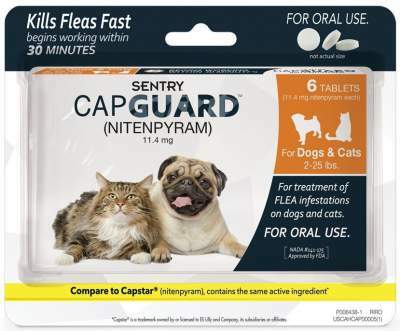 Sentry Capguard is not recommended for use in dogs that are hypersensitive or allergic to nitenpyram. It is not recommended for use in puppies that are less than 4 weeks of age. 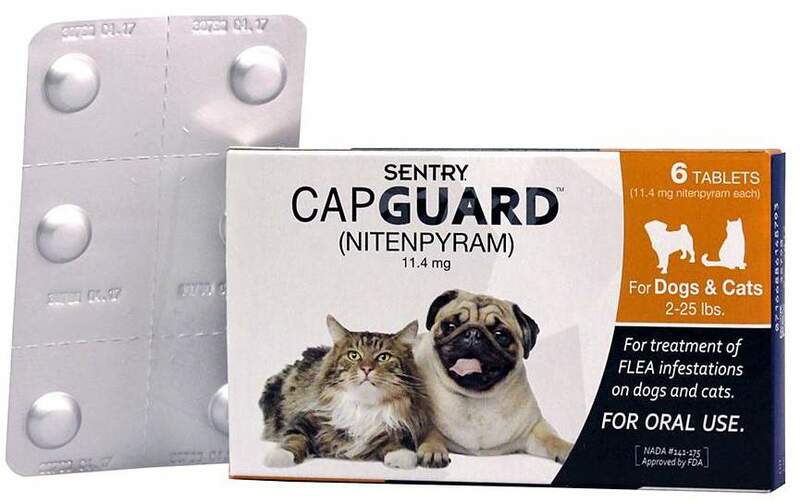 Nitenpyram in the form of Sentry Capguard will be out of your dogs's system within 24 hours. Hence, it is recommended to administer this medication every day for ongoing control. Studies have not revealed any signs of toxicity but if you do observe any unusual symptoms or behaviors then contact your veterinarian immediately. Scratching is a sure shot sign that your dog is a victim of flea or other parasitic infestation. What you need is a medication for your pet that will be highly effective and Sentry Capguard provides fast relief from fleas.